This rustic lake view home sleeps six with three bedrooms with 2 Queen beds, a full, and a single. 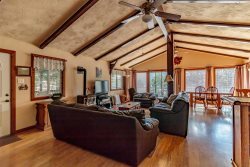 Enjoy the outdoor deck with it's lakeview, explore the area - has lake access through the creek on the property. Fully equipped kitchen, with stove, oven, microwave, coffee maker, refrigerator, WIFI. Boat dock is included.